Today we come to the dramatic conclusion of our gripping three-part series, featuring The Girls of Atomic City, by author Denise Kiernan. Okay, our finale is not quite as dramatic as the book’s, but we will do our best to keep up with you, Denise Kiernan. 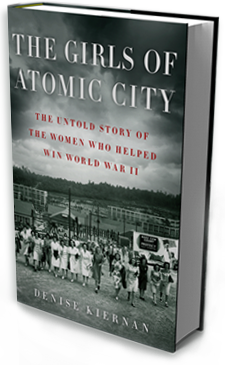 The Girls of Atomic City tells the true story of the men and women of Oak Ridge, Tennessee during World War II. None of them were natives of Oak Ridge. None of them grew up there. None of them visited their grannies in the local cemetery. Why? Because Oak Ridge, Tennessee did not exist until 1942. 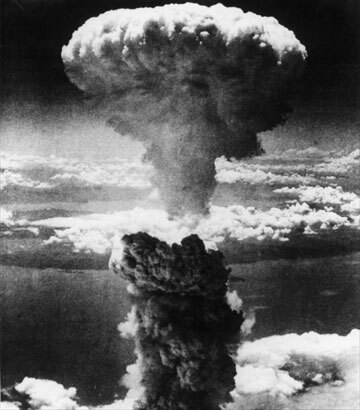 It grew from the United States’ War Department’s need to develop, in secret, the technology that went into the Atomic bomb. The residents included the nation’s top scientists, government officials, a vast network of supporting personnel, and all of their families. What started as a secret site soon grew into a secret town, eventually becoming a secret city, complete with theaters, skating rinks, multiple cafeterias, and row upon row of identical prefab houses. It is against this backdrop that Kiernan recounts the stories of the remarkable men and women involved in the creation of the world’s most deadly military weapon. The stories included range from the highly technical to the everyday, but so did life in Oak Ridge. Kiernan expertly recreated the feeling of only knowing part of the picture, a key feature in the format of the book and one of the reasons that I appreciated it so much. I’m officially a fan of all of these remarkable women: the ones who relocated to Oak Ridge and the one who wrote down their story. In the beginning, the reader gets bits and pieces of the policy and science that led to the creation of the atomic energy industry but gets far more of the excitement and nervousness of the young women involved as they travel to their new home. As the story progresses, pieces start to come together and the reader begins to appreciate how difficult life could be in this community of silent scientific breakthrough. When the bomb drops, literally, and the residents of Oak Ridge find out what they had been working on for those many long months, information is provided at an overwhelming speed. The “product” is finally named. The “gadget” is finally explained. The technical asides merge with the day-to-day accounts until the two are nearly indistinguishable. The world, the residents of Oak Ridge, and the reader finally know the big secret. Visit www.girlsofatomiccity.com for a reader’s guide, book club notes, and tons of photos, interviews, and other features. The Reading Group Guide is also available on publisher Simon & Schuster’s website. Included are questions to further your discussion, activities to help you “experience” life in Oak Ridge, and an interview with Denise Kiernan about her writing experience. This entry was posted in Non-fiction and tagged Denise Kiernan, Girls of Atomic City, Oak Ridge. Bookmark the permalink.